Erica’s versatility as a violinist sees her regularly transition between the roles of soloist, chamber musician and concertmaster. Over twelve years as founding first violinist with the Flinders Quartet she performed and recorded regularly throughout Australia and overseas including residencies at the Banff Centre for the Arts in Canada and at the International Musicians’ Seminar in the UK, as well as tours to Sweden, Switzerland and Singapore. As a chamber musician, Erica has performed in most of the major Australian festivals and has enjoyed guesting with groups including the Australian String Quartet, the Tinalley String Quartet, and the Southern Cross Soloists and collaborating with the Goldner Quartet and the Melba Quartet. Having studied in the USA, Switzerland, London and the Australian National Academy of Music with masters such as Gabor Takacs-Nagy, David Takeno, Hatto Beyerle and the Emerson and Vermeer String Quartets, Erica now enjoys mentoring and tutors for Youth Music Australia, Mount Buller Chamber Music Summer School, Melbourne Youth Music and the University of Melbourne. She has also given masterclasses in Singapore. 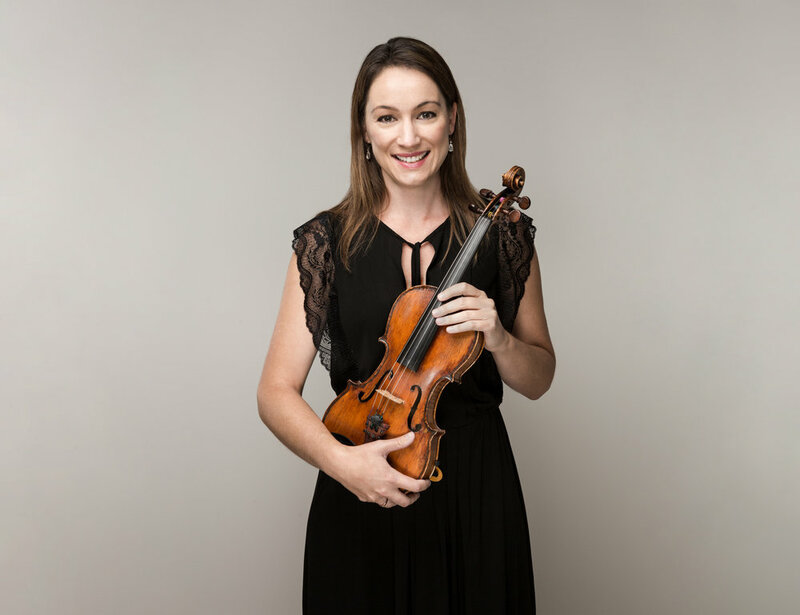 As soloist and concertmaster, Erica has performed with many of Australia’s orchestras including the Tasmanian Symphony Orchestra, the Melbourne Symphony Orchestra, the Adelaide Symphony Orchestra, Orchestra Victoria and the Melbourne Chamber Orchestra. She is currently a permanent member of Orchestra Victoria, a core member of the Melbourne Chamber Orchestra and enjoys guesting with the Melbourne Symphony Orchestra and the Australian Chamber Orchestra. Commercial recordings include the solo violin arrangement of Richard Meale’s “Cantilena Pacifica” with the Tasmanian Symphony Orchestra, “Reinventions” with the Flinders Quartet and Genevieve Lacey featuring works by Bach, Mozart, Kats-Chernin and Bowman, “Fandango” with the Flinders Quartet and guitarist Karin Schaupp and guitar and violin duos with Italian guitarist Massimo Scattolin. Having always been interested and involved in many different musical styles, Erica regularly writes and records arrangements for various artists, from rock, pop through to new Australian contemporary fusion and music for screen.